noted clock-maker (1751-1835). 4 autograph letters signed. N. p. (Small) 4to. Altogether 5¾ pp. on 7 ff. 2 letters with autogr. address. 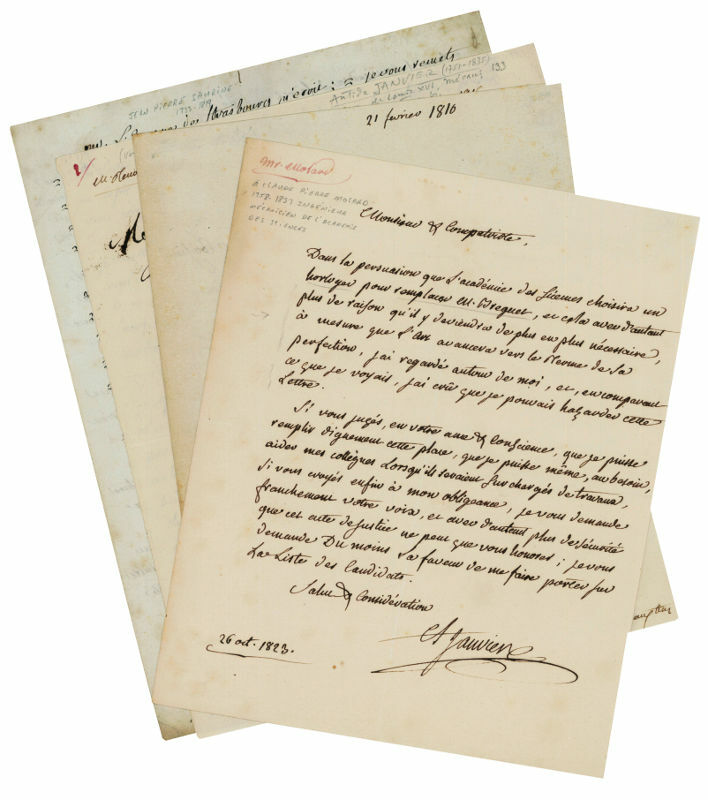 I) 10 January 1810, to E. Hutin, rue Neuve St Eustache, 32, sending him a copy of a letter he has received from the Bishop of Strasbourg (Jean Pierre Saurine, 1733-1819) concerning the non-payment of a debt by a third party to Janvier. - II: 21 February 1810, to the same. The affair has a defect; Janvier hopes to avoid a judgement. - III: 6 May 1815, to Jacques René Tenon (1724-1815, surgeon, Member of the Institute), concerning a vacancy in the section 'Mécanique' at the Institut. The sheet has been heavily scored through with a resulting ink-burn (with minor loss), running diagonally across the letter. - IV: 26 October 1823 Claude Pierre Molard (1758-1837, mechanician, member of the Institute) soliciting his support in the forthcoming election of a mechanician to replace A. L. Breguet, deceased. 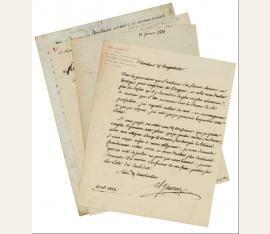 - The four letters presented here are all unknown to biographers of Janvier and cast new light on the circumstances of his bankruptcy in 1810, on his acquaintances and collaborators, and on his efforts to gain admittance to the Institut de France..